Quick Tech Trick # 7: How to show two time zones in your MS Outlook? - Blogger I.Q. You are here: Home / Guide / Quick Tech Trick # 7: How to show two time zones in your MS Outlook? Quick Tech Trick # 7: How to show two time zones in your MS Outlook? 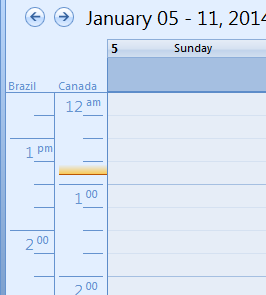 Tools > Options > Calendar Options > Time Zones > Check the box to show and ‘Additional Time Zone’. (Alternatively, you may also simply right click on the area where time is shown within your Calendar and choose ‘Change Time Zone’). Choose your required time zone > hit ‘OK’. Now you will have two time zones shown in Outlook!